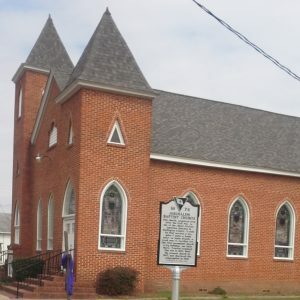 Organized soon after the Civil War, Jerusalem Baptist Church is one of the oldest black churches in Darlington County. The first services were held under a brush arbor at a site a few miles from here, and later in a log building there. The church trustees acquired this property in 1898 and built the current church in 1907. In 1939 the original frame building was covered in brick veneer, a “splendid achievement” during the Great Depression. Rev. Henry H. Butler, pastor from 1932 until his death in 1948, also served as principal of Butler School and president of Morris College.